During the last weeks we have made some effort to improve the ICAMS website. This included some structural re-arrangement due to new contents. The most important change concerns the Research Project pages (left side bar). Now you will find there detailed information on the ICAMS project groups and the ICAMS research projects. Supporting information for individual projects are accessible as well. Guests and Visitors are now filed under People at ICAMS (left side bar), where we also list our current and former staff members. Lecture Notes and Students' Projects are now filed under Teaching (left side bar). We hope that you will enjoy the new structure of our site. 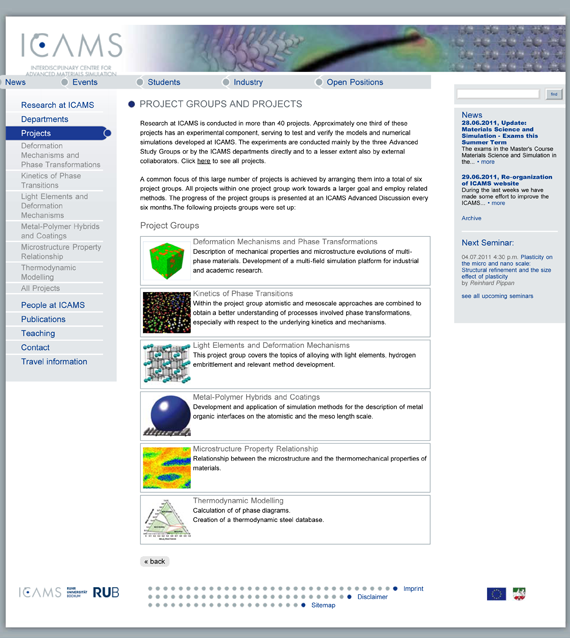 Project group page of the ICAMS website.